Press-In Inserts are made from Free Machining, Free Cutting, Leaded Brass, 300 Series Stainless Steel or Aluminium which are Passivated and Tested to ASTM Standard. 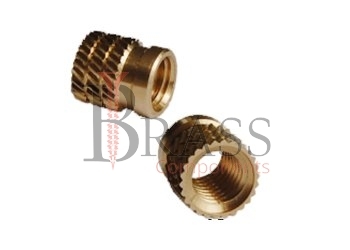 Pressed-In Inserts are available in any metric or imperial sizes as per custom specification. Install by simply pressing the inserts into pre-molded or drilled holes. Installation is accomplished using any standard press at any time during the production process. Press-In Inserts provide Strong, Reusable threads. Hexagonal Barbed Configuration ensures high torque-out and pull-out. Slotted Press-In Insert compresses allowing easy access into the mounting hole. The pilot end provides for fast alignment. Eliminates the need for Molding-In Inserts. Press-In Inserts eliminate the need for Heat or ultrasonic Equipment. Press-In Inserts offer lead free alternative. The range of Pressed-In Inserts are also available with Flange-Head which eliminates direct contact of plastic with mating parts. Straight Knurls at the top end of the insert offers higher torsional resistance. Standard Press-In Inserts provide Excellent Torque-out resistance. Provides clean threads and screw locking action not obtainable in molded-in inserts. Press-In Inserts meet RoHS Requirement and UL Listed. Pressed-In Inserts are ideal for light weight design. Most Commonly used in thermoset or other hard plastics. The general range of Press-In Inserts are used for cored or drilled holes in plastics. Designed to replace molded-in inserts and threads in plastic castings. Press-In Inserts used in High Stress, Outdoor and Corrosive Applications. We manufacture Press In Inserts as per Custom Specification and export in Germany, Spain, Netherlands, Portugal, UK and other European Countries. For more Information, Please Contact Us or Inquiry Now.